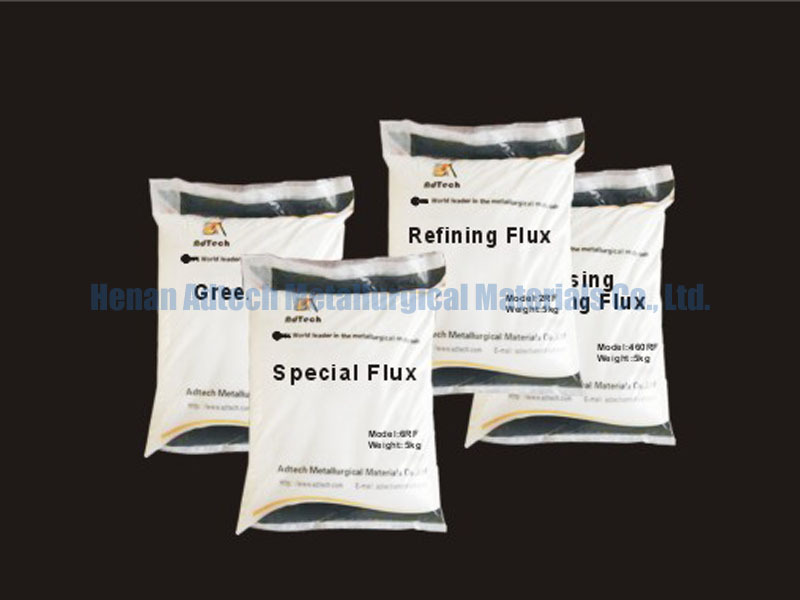 Flux For Aluminum Melting-AdTech Metallurgical Materials Co.,Ltd. Flux For Aluminum Melting is solid substances (commonly mixtures of chloride and fluoride salts) used in aluminum foundries in order to reduce the melt oxidation, minimize penetration of the atmospheric Hydrogen, absorb non-metallic inclusions suspended in the melt, keep the furnace/ladle wall clean from the built up oxides, decrease the content of aluminum entrapped in the dross, remove hydrogen dissolved in the melt, provide aluminum grain refining during Solidification, modify silicon inclusions in silicon containing alloys, oxidize excessive magnesium. Common practice of flux introduction is manual application. Most of the fluxes are applied on the melt surface and stirred into the melt. Some of the fluxes (degassing, grain refining) are plunged to the bottom by a clean preheated perforated bell. Fluxes may also be introduced into the melt by injection in form of a powder in an inert gas (Argon or Nitrogen) stream. The simplest flux injection technique is a lance immersed into the melt. The most effective flux introduction method is injection by rotary degasser. Fluxes composed of chlorine and fluorine containing salts are used for degassing molten aluminum alloys. Degassing fluxes are commonly shaped in form of tablets. Degassing operation starts when a flux tablet is plunged by a clean preheated perforated bell to the furnace bottom. The flux components react with aluminum forming gaseous compounds (aluminum chloride, aluminum fluoride). The gas is bubbling and rising through the melt. Partial pressure of hydrogen in the formed bubbles is very low therefore it diffuses from the molten aluminum into the bubbles. The bubbles escape from the melt and the gas is then removed by the exhausting system. The process continues until bubbling ceases. Degassing flux may also be introduced by an injection method. In this case the inert gas serves as carrier for granulated flux. Besides the degassing effect the degassing treatment allows to remove non-metallic inclusions suspended in the melt (cleaning effect). Grain refining fluxes composed of salts containing titanium and boron (K2TiF6 and KBF4). The fluxes cause formation of numerous nuclei of TiAl3 TiB2 when aluminum melt cools down. Aluminum grains start solidification on the nuclei surface. The average solid grain size is determined by the concentration of the nuclei in the melt before solidification. Fine grain structure is characterized by better fluidity during solidification, low Microsegregation of impurities, low shrinkage porosity. Alternative method of aluminum grain refining is introduction of master alloys containing titanium and boron (eg. Al-5%Ti-1%B).